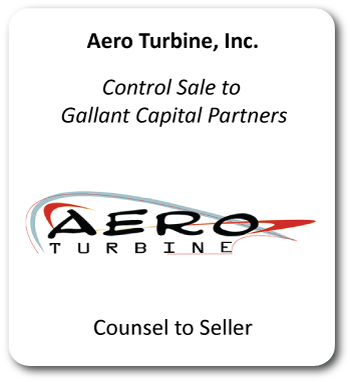 LOS ANGELES—Jeffer Mangels Butler & Mitchell LLP (JMBM) is pleased to announce that Aero Turbine, Inc., a leading aerospace maintenance, repair and overhaul service provider supporting the U.S. military and commercial enterprises, has completed a control sale to Gallant Capital Partners. Partner Michael Steuch led the JMBM deal team and was assisted by Megan Schmenk, David Ma and Ryan Nowicki. Founded in 1978, Aero Turbine has been dedicated to developing and providing the highest level of turbine engine and accessory overhaul, repair and testing capabilities since serving its first customer, the U.S. Air Force. Since then the U.S. Navy and Army have been added to its client roster, along with the military forces of more than 20 nations around the globe, and a host of commercial clients. Aero Turbine continues to expand the range of turbine engines it services, with an emphasis on vintage and legacy powerplants. The company has been honored by the U.S. Federal Government with a Contractor of the Year Award for its work with the U.S. Air Force. For more information, see www.aeroturbine.aero. JMBM’s corporate and tax lawyers represent companies and capital providers in a wide variety of acquisitions, financings and sales. The Group’s lawyers provide start-to-finish assistance with the structuring, negotiation, documentation and closing of the deal, using the firm’s full resources for everything from sensitive IP/environmental/labor issues to tax-efficient deal structures. For more information, see www.jmbm.com.